Dr. Rizk’s passion is joint replacement. By completing a specialized fellowship in total joint replacement and adult reconstructive surgery, Dr. Rizk brings to Beaumont the latest, most advanced techniques in joint replacement. 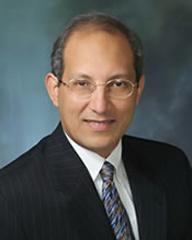 As a pioneer in his field, Dr. Rizk implemented the computerized navigation system for knee replacement to improve the quality of care in Beaumont. To further serve his patients, he performs minimally invasive techniques in hip and knee surgery including ceramic hip and partial knee replacement.